Cauliflower has become a recent craze in vegetable delights. It’s made into pizza crust, and substituted for rice and couscous for pasta-like dishes. It’s an odd-looking vegetable surrounded by green leaves on the outside. Inside is a white edible, curd-like flesh. To me, a cauliflower is like a blank canvas in the culinary world waiting to be discovered. It’s packed with phytochemicals that helps the liver neutralize toxic substances, and protect against cancer and heart disease. To choose the perfect cauliflower, make sure it has a firm head, and no soft brownish or yellow spots. Make sure you wash it thoroughly before you start cooking. 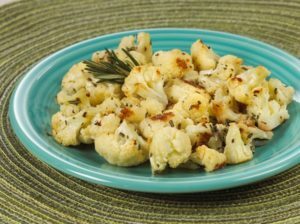 Check out this DaVita Eats video to see how easy it is to make roasted cauliflower. In addition, check out 8 Crazy about Kidney-Friendly Cauliflower recipes from DaVita dietitians as well as the cauliflower recipes below. In addition to the above recipes think about these possibilities for cauliflower dishes: mashed cauliflower, grilled or roasted cauliflower steaks, cauliflower soup, cauliflower ‘tots’ (instead of potato tots), cauliflower fritters and cauliflower tabbouleh. Start exploring this low potassium, kidney-friendly vegetable today and share your ideas. Always check with your doctor or dietitian when adding new foods to your diet. 1“Cauliflower, raw Nutrition Fact and Calories”. Self-Nutrition Data. http://nutritiondata.self.com/facts/vegetables-and-vegetable-products/2390/2. Accessed 3/2/2017. Takako has been a registered dietitian for 13 years and enjoys educating people about nutrition. She loves spending time with her husband and two children. She also has interest in kickboxing, hiking, and traveling places to try new foods.